Tag line: "Can't repeat the past? ...of course you can!" I never read F. Scott Fitzgerald’s The Great Gatsby, nor have I seen the 1974 movie starring Robert Redford and Mia Farrow that was based on it. But even if I had, I doubt either would have generated as much excitement for the jazz age as this 2013 version did. While languishing away in a mental health facility, former Wall Street broker Nick Carraway (Tobey Maguire) reflects on his days in New York City, when, at the height of prosperity in the 1920s, he rented a house in West Egg, Long Island, right next door to the mansion of a multi-millionaire named Jay Gatsby (Leonardo DiCaprio). Nick’s cousin, Daisy (Carey Mulligan), lived just across the lake with her wealthy husband (and Nick’s old college chum) Tom Buchanan (Joel Edgerton). Tom, it turns out, was less than an ideal spouse; he had a mistress, Myrtle (Isla Fisher), who he visited whenever he was in the city, and didn’t even try to hide his dalliances from his wife. Nick tagged along once on one of Tom’s jaunts, and experienced some of what the fast life had to offer, but as it turned out, it was merely a precursor of what was to come. 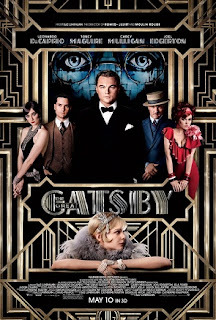 Director Baz Luhrmann pulls out all the stops for his updated version of The Great Gatsby, doing for the 1920’s what he did for turn-of-the-century Paris in Moulin Rouge. 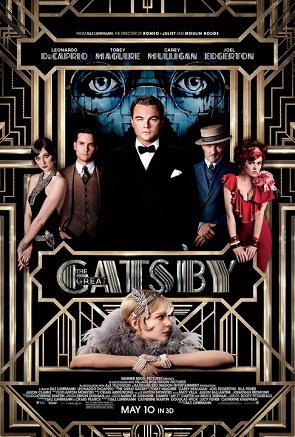 Utilizing hip-hop music by Jay-Z (not to mentio0n the excellent tune “Young and Beautiful” by Lana Del Rey), Luhrmann helped modern audiences feel the excitement of the Jazz Age. As a result, The Great Gatsby, despite being a dramatic love story, has an energy to it that’s as vibrant as what you’d find in any action film (Gatsby’s parties are wild and out-of-control, with an electricity that had me wishing I could attend one myself). The movie is definitely effects-heavy, utilizing its share of “green-screen” shots to bring this era to life. Yet despite its sometimes artificial look, these effects also had their moments of brilliance (I loved the shots of Gatsby’s yellow car racing through the streets of New York). DiCaprio is… as always… quite good as the mild-mannered Gatsby, whose demeanor masks a darker side that’s only hinted at through most of the movie, while Tobey Maguire delivers what I consider to be his finest performance as the wide-eyed newbie drawn into high society (ever since I was a kid, my favorite character in classical literature was Jim Hawkins from Treasure Island, and I always wanted to trade places with him. After seeing this movie, I instead want to be Nick Carroway). In addition, I can see why Gatsby, or indeed anyone else, would fall in love with Carey Mulligan’s Daisy, a gorgeous woman of the world whose eyes occasionally reveal a glimmer of innocence (reminding me, in a way, of Audrey Hepburn’s Holly Golightly in Breakfast at Tiffany’s). The scene in which Gatsby invites Daisy to spend an afternoon in his vast estate is among the film’s most romantic sequences, and it’s because of DiCaprio and Mulligan that it’s as impressive as it is. Rounding out the main cast is Joel Edgerton, slimy as hell as Tom, and Isla Fisher, who convincingly walks a fine line between an alluring beauty and a common harlot.